Here’s the pleasantly surprising review I promised. THE FORGOTTEN PLANET is a fix-up. That means it was originally published as three separate stories (“The Mad Planet;” Argosy June 1920; “The Red Dust;” Argosy April 1921; and “Nightmare Planet;” Science Fiction Plus June 1953). The sequence was reworked for a 1954 Gnome HB release. A 1956 Ace pb followed. 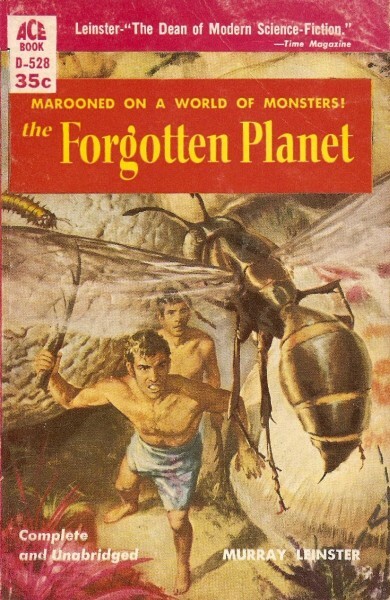 This book is currently tied with THE HAUNTING (Shirley Jackson) and THE MAN WHO COUNTS/WAR OF THE WING MEN (Poul Anderson) as the 10th best 1950’s sf novel, with a rating of 88. The last paper edition that I know of was published in Oct. 2003, but it currently is available FOR FREE as a Baen Library ebook (check their website under the Baen Free Library) under the title PLANETS OF ADVENTURE, so you all have no excuse not to check it out.